We hope that you are enjoying our free internet tricks and other loot tricks. This article for airtel users. 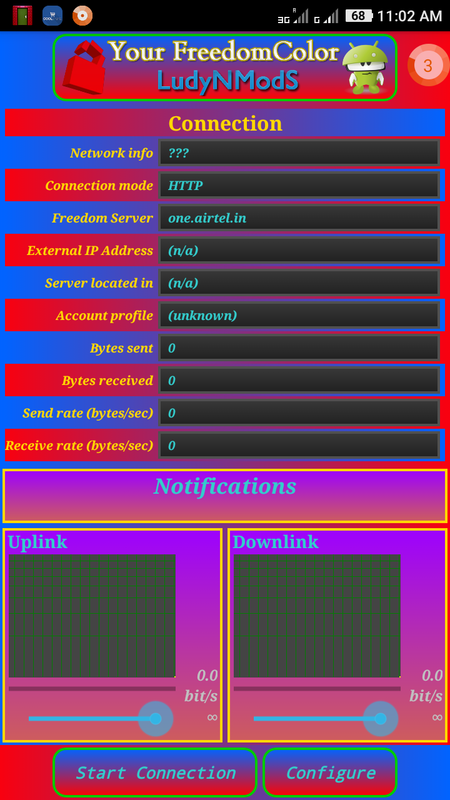 This airtel free internet trick is based on airtel free host and here we are using Your Freedom app. Unlike other free internet tricks, this trick works on both Windows and android devices. By following below steps you can enjoy free internet on your airtel sim as same as paid internet. there are no restrictions like proxy tricks. ** Works on zero balance. Important Note before going to the steps: In 2G network, the chance of working this trick is very less. You need 3G network to work this trick. So try this trick with any active small data pack or try with ‘ airtel 3g zero rental pack’. We recommend you to activate airtel 3g zero rental pack before doing below steps so that you will get 3g access even without any data packs. Here is the tutorial on how to activate airtel 3g zero rental pack on your airtel sim [click here]to get 3g access at zero balance and without data packs. 1. First download Your Freedom app on your android device. Note – here we are providing modded version of Your freedom app: LudyNMods Your Freedom app. So that you don’t need to register an account on your freedom and there are no limits. 5. Your Freedom app will be connected soon. after the successful connection, you are able to use internet free. Start enjoying free internet browsing and downloading free on your android with airtel sim. Note: This is not verified by me. anyway, he said it is working fine in Kerala. Try. Nothing is losing by just trying. As I said above, by following this airtel free internet Your Freedom VPN trick you can use the internet as same as paid internet data. You can browse any website, there are no restrictions. Also, you are able to download anything from the internet. Yeah, completely free internet. no need of paying bucks for using the internet on airtel. bhai ye thodi der baad apne aap disconnect ho jati hai any solution ? does the trick apply in Kenya? Will it work for blocked Airtel sim . no, works only with unblocked sims. It says" your proxy settings seems not working "
Please help I am in middle of nowhere I have my very important exam in November 6 and I only take online classes, and my mobile was pickpocketed in which I have my internet (and it was very expensive for me,). It says "your proxy settings seems not working"
Thank you. Hope your support in future too. sir!! isme sim blockage isssue hai ya nahi/?? plz rplyyy…. brother, limit your usage below 100mb per day to avoid sim blocking. Lekin 250 mb per day hai or month bro??? bro, actually it was 250 MB per day before. but now airtel limits free hosts to 250mb per month so all the tricks limited 250mb per month. Thanks for the airtel free internet unlimited trick. what error you are getting when switching to 3g/4g ?